That is lovely. I proper manly hat! What a fabulous hat. I've wanted to try that pattern, I love the way the crown looks. Excellent colour too. I'd be surprised if you get that hat back at all! DH looks very happy with it! Great pattern choice! Nice to see it done up. I've had it in my list on ravelry for quite some time now but have not had anyone needing a hat. What a great hat, I love how the decreases look. The style of that hat is quite neat, nicely done! It looks great- you did good job with the re-sizing! that turned out great. I'm impressed that the goat cooperated. Thanks for all the compliments you all! Dina, Just to let you know in case you decide to knit it anyway, the pattern is much easier than it looks and knits up quickly! Kathleen, We've just got our goats a few months ago. We are trying to rid our pasture of blackberries without using herbicides. 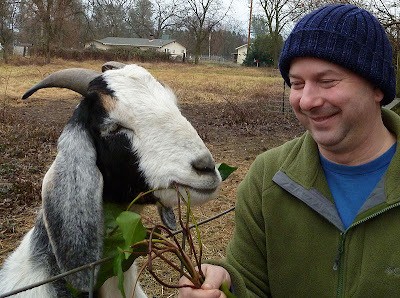 The goats are fun but a lot of work too. I will have to write a post about them sometime. Lovely hat pattern, hubby wants a new hat so I shall be popping pattern into my 'to do' pile. Great hat choice. I love that it looks good from the top and the sides. I think you might need to make one for your Hubby. He looks very happy in it. Great hat, but even cuter goats!! The hat turned out totally awesome! Love the decreases and the color. Fab hat! Madelinetosh is my new yarn crush. It's so beautiful. 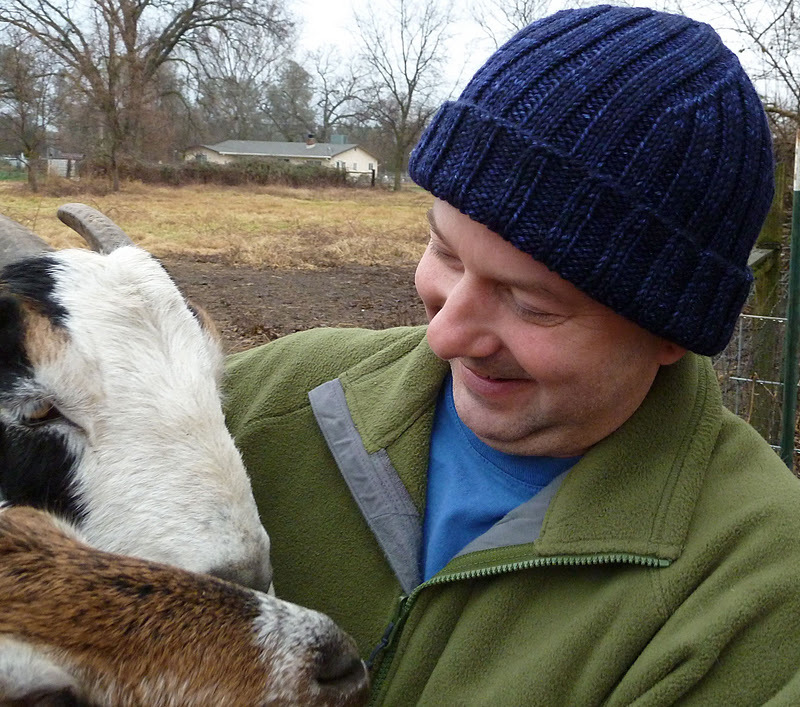 I'm also totally in love with your goats! They're so cute! That hat is so nice! It looks like you had a fun time with the photo shoot too! Great hat! I made it a few years ago for one of my sons :) Have a great weekend! What a great hat! Those decreases in the crown make it a real standout as well as the yarn choice. That hat is fab and I agree, I love the decreases. Your hat looks great. 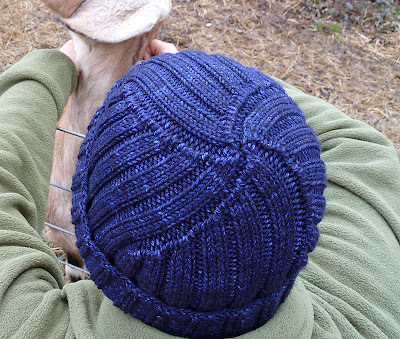 I love the pattern and the yarn is a terrific, rich blue. Great hat! The color is so great too! P.S. Love your goats! I hope to have some of my own some day! It's gorgeous! I've got to knit that! I made the same hat for my husband couple of years ago, such a fun pattern! 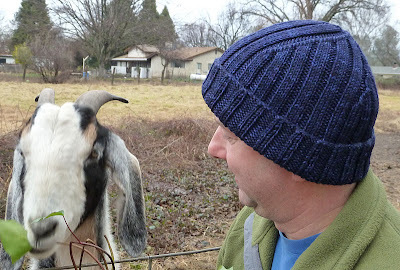 Nice hat and cute goats. The hat looks great, and your goats are really cute! That is a fabulous man hat - I just put it in my favorites! Looks great! I really like the decreasing and that color is fab. Nicely done! I love that hat! Sometimes it's tough to come up with something the hubbys will wear. Looks cute and toasty though! Wait. The socks aren't blue. Looking at them again they seem to hover over the page. The color seems an electric purple/blue + a hue I can't name, Can you?